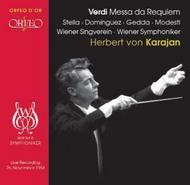 Herbert von Karajan joined forces with the Vienna Symphony Orchestra and the Singverein in November 1954 to perform Verdi's Requiem. Even at this relatively early date, he was able to bring together a team of international soloists. Antonietta Stella had made her spectacular d�but as Leonora in La forza del destino in Rome in 1951 and was often to be heard in Italian roles in many of the world's great opera houses. With her radiant soprano voice, she ensured that under Karajan's direction the 'Libera me' left an overwhelming impression. As Clemens H�slinger wrote at the time, the 'Hostias' was sung "as if by a 'vox coelestis'" by the tenor Nicolai Gedda, who in one of his earliest appearances in Vienna gave proof of his unique gifts and musicality, qualities that were to enthral music lovers for decades to come. The Italian bass Giuseppe Modesti was then at the height of his career. A member of the La Scala ensemble, he gave guest performances all over the world, impressing Viennese audiences, too, with his true basso profundo. The Verdi Requiem was also one of the cornerstones of the repertory of the Mexican contralto Oralia Dominguez. Although she was not yet 30, she had already appeared under such eminent conductors as Victor de Sabata and Ferenc Fricsay, in addition to Karajan himself. It goes without saying that with an ensemble of this excellence, Karajan's interpretation is in no way inferior to his later readings of the work but offers a highly interesting alternative in terms of its vivacity and brio.